A trailer for The Endless released in late 2017. This horror title also had a showing at last year's Tribeca Film Festival. The film has been developed by directors Justin Benson and Aaron Moorhead. This duo is also responsible for 2012's thriller Resolution and 2014's monstrous Spring. Both directors also star in the film. And, Callie Hernandez (Alien: Covenant), Tate Ellington, James Jordan and Lew Temple also star. The film's official poster is hosted here, along with other film details. The synopsis talks about two brothers and a mysterious message. The brothers remember their experience, in a cult, very differently. When a strange phenomenon occurs, they are forced to re-assess their beliefs, instilled in them by the cult. The poster is an amazing graphic. There are monuments with eyes. The whole universe is captured in the upper panels. Meanwhile, a cult prays below as the brothers look on. 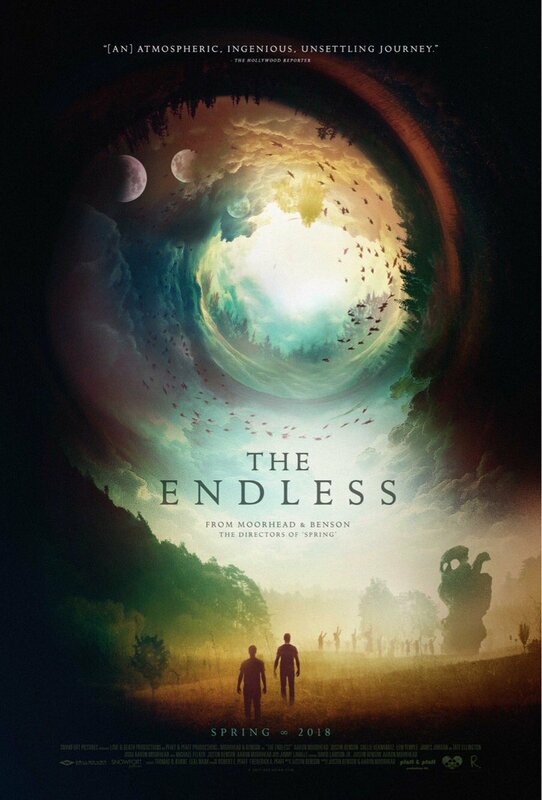 There is a lot going on within The Endless, graphically. Film fans can click on the graphic for a closer look. As well, the trailer below shows more of the film's strange occurrences. Release Date: March 23rd, 2018 (TBA). Cast: Callie Hernandez, Tate Ellington, James Jordan, Lew Temple and Emily Montague.